analysis of the urine as an aid in the diagnosis of disease. Many types of test are used in analyzing the urine in order to determine whether it contains abnormal substances indicative of disease. The most significant substances normally absent from urine and detected by urinalysis are protein, glucose, acetone, blood, pus, and casts. Medical intervention for abdominal angina can include supportive care including anticoagulant therapy. Surgical intervention includes angioplasty, partial colectomy, (removing the ischemic section of the bowel and reconnecting the remaining ends). It may be necessary to create a colostomy or ileostomy and to correct blockages in the mesenteric arteries. The patient must be monitored for signs and symptoms of peritonitis and/or sepsis. As the patient recovers, patient education focuses on prevention of further episodes, recognition of signs and symptoms including cramping abdominal pain after eating, blood in the stool, red or black stools, diarrhea and/or constipation. It also includes instructions and support for living with permanent or temporary colostomy or ileostomy. Attacks of angina pectoris occurring while a person is in a recumbent position. Angina pectoris occurring in the days or weeks before a myocardial infarction. The symptoms may be unrecognized by patients without a history of coronary artery disease. Unrecognized angina pectoris that presents with symptoms other than chest pain or pressure. The patient may experience dyspnea on exertion, heartburn, nausea, pain in the arm, jaw pain, tenderness in back or arms (in women), or other atypical symptoms. Silent angina pectoris occurs most often in older adults, in women, in postoperative patients who are heavily medicated, or in patients with diabetic neuropathy. 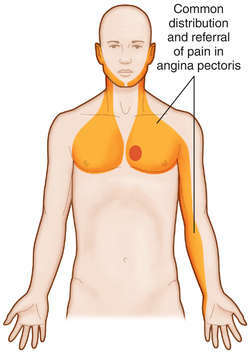 Angina that occurs with exercise and is predictable. It is usually promptly relieved by rest or nitroglycerin. Angina that has changed to a more frequent and more severe form. Its symptoms include chest pain that occurs with minimal exertion (or that progresses from pain with exertion to pain occurring with minimal exertion or at rest) and may be an indication of a severe obstruction in a coronary artery and impending myocardial infarction. It is a medical emergency, and should be aggressively managed. Angina due to spasm of the coronary arteries rather than from exertion or other increased demands on the heart. The pain typically occurs at rest. During coronary catheterization the spasm is usually found near an atherosclerotic plaque, often in the right coronary artery. Infusions of ergonovine may provoke it. On the electrocardiogram, the diagnostic hallmark is elevation of the ST segments during episodes of resting pain. Treatments include nitrates and calcium channel blocking drugs. Beta-blocking drugs, frequently used as first-line therapy in typical angina pectoris, are often ineffective with this angina.